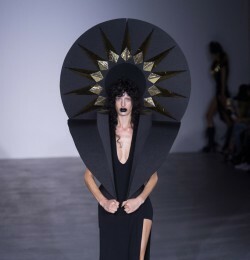 Gareth Pugh is a british fashion label, that now is based in London. It was founded by Gareth Pugh and his business partner Michele Lamy. 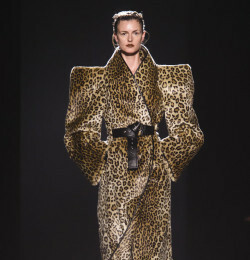 Since 2006 Gareth Pugh has shown at London Fashion Week. 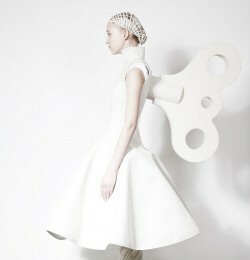 Pugh began to show his collections in Paris from the S/S 2009 season. His clothes can be found at Browns in London, Colette in Paris, Seven, Barneys and Bergdorf Goodman in New York. A single piece can sell for thousands of dollars, and only the most spirited, open-minded, fashion forward and assured customer are ever likely to buy and wear them. 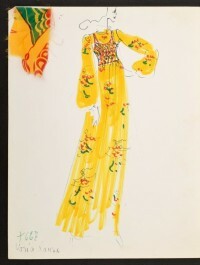 Pughï¿½s style is at the opposite of traditional fashion. Inspired by punk and gothic scenes, as well as video games and films, his designs feature leather, lots of black and even couture pins. Sculptural proportions bordering on the obscene, atypical forms, and fetishist haircuts typify the young Londonerï¿½s designsï¿½always faithful to the clubbing Boombox culture, and worthy of the best sci-fi films. Every one of his shows, for which critics impatiently await, is a spectacle to behold. 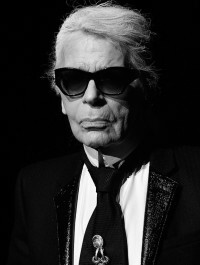 His elegant and rebellious designs make for big fashion headlines.